I’m at the Imbarcadero Lecco, the ferry station where boats leave for Varenna and Bellagio. A creamy cappuccino and a golden brioche are my companions. We sit silently looking out to Malgrate, the picturesque town on the opposite shore. The ferry approaches almost with gliding stealth until the engines roar into reverse preventing the craft from colliding into the steel-grated dock. The skipper yells something to the crewmen and a large soggy rope is slung onto the bollard. A steel gangplank is pushed out with a screeching bang. The noise and the smell of diesel fill the air but nothing can distract my gaze towards the distant Alps and shimmering blue waters of Lake Como. Imbarcadero Lecco – This is where you buy tickets to travel from Lecco to other towns by ferry. Note: Ferries from Lecco are not frequent. There are only about three a day. Ferries from Lecco go to Valmadrera, Abbadia L., Mandello L., Onno, Vassena, Limonta, Lierna and Bellagio. Ferries operate from the last week of April to the last week of October. The ferry zigzags across the lake from shore to shore, town to town. It’s a pleasant ride. The complete trip Lecco to Bellagio is 1.5 hours in total. You can plan your ferry excursions and see timetables for Lake Como ferries on the Navigazione Laghi website for Lake Como. Imbarcadero Lecco Bar & Cafè is one of my favorite places for morning coffee. 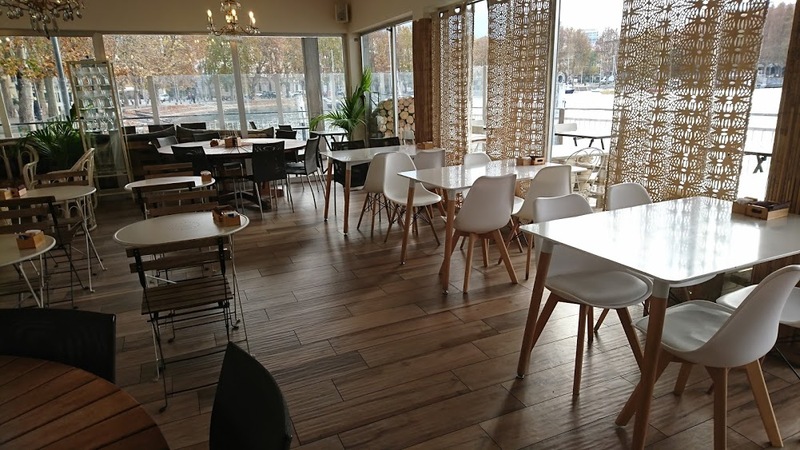 They have lovely pastries and brioche and in spring and summer, it’s so relaxing sitting looking out to the lake. Lakeside Happy Hour with “all you can eat” buffet. For €12 you can get a cocktail and eat from the buffet table of hot pasta dishes, quiche pies, focaccia, cheeses, and cold cuts.